Okay, so that is no ordinary price tag, but this is no ordinary car. McLaren have been producing fast cars for quite some time now, and have not been too shabby in the pinnacle of motorsport, Formula One. So it should come as no surprise that they can build a good-looking, fast car. But then track dominance doesn’t always translate to road performance… but then some times, it does. And this was definitely the latter. I’ll be honest, when McLaren agreed to lend me a car, one of their sports series (yes, even at this price and performance, it’’s not a super car, according to McLaren…) I was understandably excited. I had a look at the website and became even more so. I had one concern… that my review model would come in Mantis Green. And of course, it did. But even that didn’t dampen the joy of seeing it arrive – in it’s own truck. And the noise, even as it was backed down the ramps… spine tingling. There was no doubt that this was going to be an exciting few days filled with runs to the shop whenever we were short of the basic essentials… or anything that could conceivably be useful. As long as it didn’t require more then three or four shopping bags… not a great deal of practical boot space (in the front) but then if you want practical, you opt for the 570GT so that’s not a complaint. Then there’s the manner in which you enter the car – beautiful dihedral doors (a McLaren signature) instantly tell you that everything you are about to experience is slightly different. And from the moment you close them and press the starter, hearing the 3.8 litre, twin turbo V8 roar to life you know that this car probably has more power than you have ability. Very probably. That’s a good point to talk about – last year when I drove the similarly powerful Audi R8 (granted with four-wheel-drive) you had the sense that you could keep pushing and the Audi would look after you. This was a different kettle of fish completely. It was incredibly planted, and stable, yet the feedback through the wheel was always reminding you that it was the master and you are just the apprentice. Even then, once you got used to your limits (not the car’s limits) it was surprisingly drivable. The auto gearbox was great, and as long as you remember not to drive around town in sports mode then the similarly awesome tuned exhaust behaved until you hit the open road. So, to the open road. I figured a jaunt around the twists of the Forest of Dean would give me a good feel for the car’s performance – brakes, acceleration and handling… so that’s where I went. With only two seats (obviously) my wife and I left the kids with the in-laws and took to the road. My wife was surprised by the comfort – it was unexpectedly smooth over the bumps and so long as you didn’t hit one of the larger pot-holes, not at all jarring. I also took my 15-year old nephew out for a spin as he is a bit of a car nut. Simply put, I think it was a hit. He posted some video clips to Snapchat (which I’m assuming means it was good) and when i explained that this cost more than a two bed house he simply replied: ‘I’d buy the car.’ More words than a 15-year old usually strings together so I guess that’s also praise! So it passed the wife test, the nephew test, and of course my six-year old son loved it – apparently the defining feature for a car being classed as ‘cool’ is the doors opening upwards. 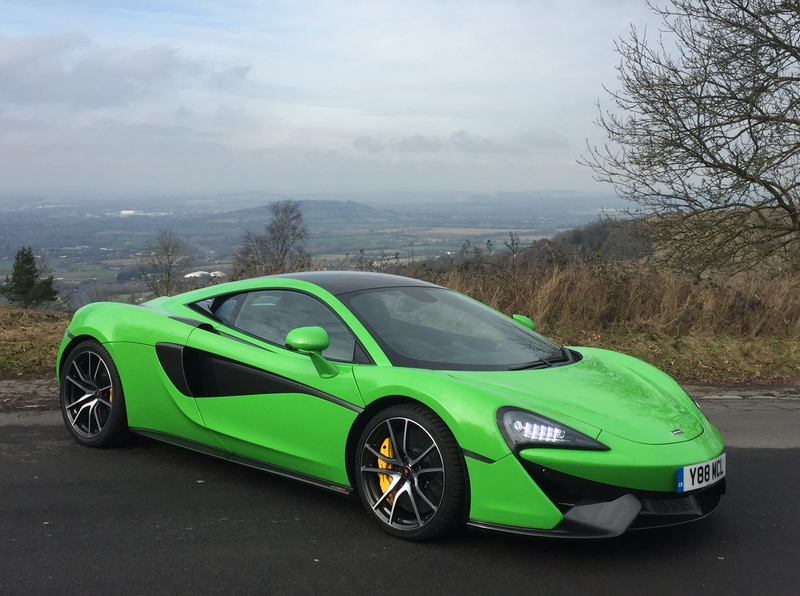 If however, your criteria go a bit further, the 570S will meet them all. And then go a bit further. It was simply incredible – it goes as fast as it looks like it should, handles better than anything that goes that fast should, and feels more comfortable than anything with such low profile tyres and a low ground clearance has a right to. I loved it, pretty much everyone else loved it, and I got more looks, glances, and stares driving this than I have in almost anything else. Would I buy one? If my price range stretched this far I’m not sure what would beat it. Apart from the 570GT. And perhaps, the Aston Martin DB9GT. But it would be an incredibly close call. Seriously, don’t make me choose… just give me the budget to buy both instead. Please?